I have a mounted cup wheel now with a resin bonded diamond media. It cuts extremely fine burrs for the shsrpening. 1 to two passes cuts my final edge bevel and leaves a fine hair thin burr. 1 pass on a power strop will leave a razor edge. I have seen a rubber bonded one but can't lose category it. I have seen sources for other media in a diamond bond. Team, I have been trying to locate a cup grinding wheel with rubberized diamond abrasive. I have seen this used by a knife maker in Alabama. I have a resin bonded cup wheel which works well but sometimes chatters. Anyone know of a source for this. Great I am starter too and Bay City is close. We may have to get together sometime. My thought but ya never know what someone has lying around. Team. Acquired this blower and refurbishing rite now. 1 week to melt the gook out and rebuilt gear box with new bushings. Super smooth now. Looking for a fan side housing. Someone dodge a hack job welding a bracket and left big hole. Don't really trust the old mounting. Anyone got an extra piece. Yea I have a 4 inch ram about 8 feet long. 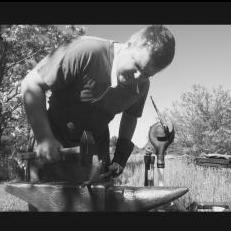 Using part to pound a cone anvil. Got to soften it in a fire though. It's XXXX to cut. Watch your language. Yea it should have been harden and temper. 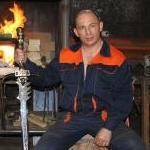 Have been reading the heat treating guide and use a professional machinest/blacksmith for help. You guys are Grammer hammers. My fault not reviewing before posting. Perhaps I should elaborate on the steel in question. Extremely heavy pin used in a commercial truck scale. By mild I should have said suft. In spread easily just driving the pin out of a 12 inch I-beam it's set into. Don't know what it is but mean to see if it will harden before waste time forging anything. How does that sound. Team. I have a couple of mild steel rods I was thinking of making a rounder and other tools from. Now it is quite soft. Do you think it would work when hardened and annealed? They are about 3 inches in dia. Cardinal. I have had to use a professional HAZMAT group to clean pigeon feces out of an old warehouse that we converted into a boat shop. This stuff can kill. Pressure wash and disinfect. Then shoot with cheapo paint to make sure. Keep the space just make it safe. Great space with good light. Use athe least an N'95 mask or better when u wash. You don't have the build-up I was dealing with so you should be fine to DIY it. Sounds good. Built my coal/charcoal forge on an old wagon gives us shelf and wheels. It sounds like a sensitivity to the coup. Get to doctor and then soak the place top to bottom with a bleach mix to help kill mold and bacteria. This stuff can get more acute with prolonged exposure. Chicken coups are nasty places even after years empty. Turbine roof vent also pull a lot of air. Good stuff can be found at scrap grinding yards. They lay aside anything to big or hard to gring. I got a massive 14x30x2.5 inch slab of machined steel at 25 cents a pound. Also bid hydraulic rams. Forklift parts even 400 pound manganese hammer teeth from the shreaders ($1) a pound. Get the yard managers number they are awsome sourses. Mine calls me when he finds items I'm looking for. Scrap is cheap.